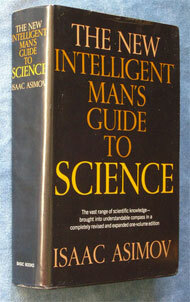 Of all the books my parent’s shelves, the weighty, dog eared volume I remember turning to most as a young person was “The Intelligent Man’s Guide to Science”, by Isaac Asimov. For a generation, Asimov defined the rational approach, and a sense of the possibilities that reason and science might bring. His science fiction work is legendary, and a primary inspiration for many of the imaginary universes that permeate pop culture. This video is part of a longer presentation at the Humanist Institute in New York in 1989, and it demonstrates yet again one of the primary messages of this series, — that the broad outlines of the climate change story have been understood for decades by, well, intelligent men people who are guided by science. It’s been a recurring theme in this series – that the science was essentially complete long before Al Gore, long before the IPCC, long before the Hockey Stick. The hangup has been the organized campaign of lies and distortions that has made political action impossible on the issue. In case there’s any doubt about Asimov’s 1989 statement that he had been talking about the Greenhouse effect for 20 years, below you can listen to a brief radio interview on that very topic from 1977. Here are some more examples of how well we have understood climate change, and for how long. The good earth is dying. 15 years ago, I remember reading the last chapter in the Faber Book of Science, written by Asimov and entitled “The Good Earth is Dying”. “Certainly humanity cannot survive another generation of constantly growing demand. If it goes on before and the changes do not happen before the year 2000, the technological structure of the human society will be destroyed almost with certainty. Then humanity, thrown back in barbarian states, could absolutely await her effacement and the planet severely lose its ability to support life. I had heard of Isaac Asimov, but I suppose my generation is a tad too young to have grown up with his writings. I may have to look him up. Hmmm, “The Good Earth is Dying”. Interesting. Some may claim that we are “alarmists” for even reading such material, but I like to think of myself as a realist. I try not to color my perspective with a “just world” assumption. I just look at the way I perceive the world to work and determine what changes need to be made, if any, to direct our course to a pleasant future. I feel that is the duty of an informed citizen. I wonder what specifically Mr. Asimov thought would destroy human society’s technological structure following the year 2000? Global warming? Depletion of natural resources? World war? He was worried about overpopulation. There was an article of his in Omni magazine around 1983 about it too.